:In 1911, Carrie Strahorn wrote a memoir entitled Fifteen Thousand Miles by Stage, which shared some of the most exciting events of 25 years of traveling and shaping the American West with her husband, Robert Strahorn, a railroad promoter, investor, and writer. That is all fact. Everything She Didn't Say imagines Carrie nearly ten years later as she decides to write down what was really on her mind during those adventurous nomadic years. 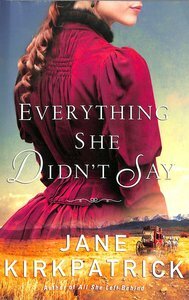 About "Everything She Didn't Say"